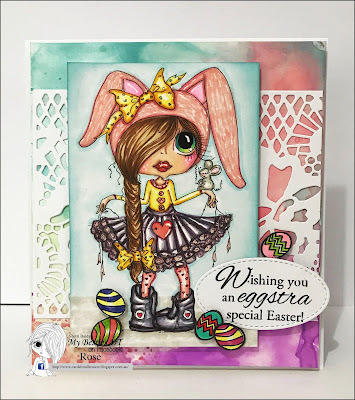 Today I am here to share some Post it note holders I made using the 3D Deco Card Toppers Bestie Bunny and you can find this printable file HERE. I just love how these turned out!! If you are interested in the tutorial on making these you can click HERE. Thanks for stopping by and have a craft day! 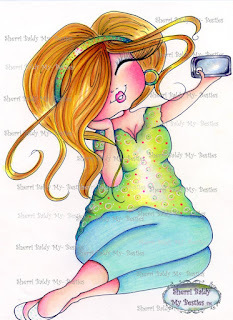 Today I am sharing an image I colored with my Prismacolor Pencils img689 and she is such a sweet little fairy!!! 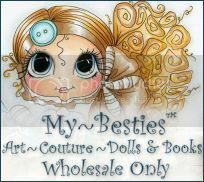 You can find her at the My Besties shop. I decided I wanted to add her to this pretty box I had. So I die cut her and used red tape to add her to the box top. Then added some pretty flowers, a bow and some sparkly gems. Anyone that knows me very well knows I love flowers of any shape or kind! I get that from my Mom and my enthusiasm has spread to my Hubby-last year in our pasture, he planted over 300,000 Zinnia seeds in a spiral garden so I could walk around them and cut one of my favorite flowers. 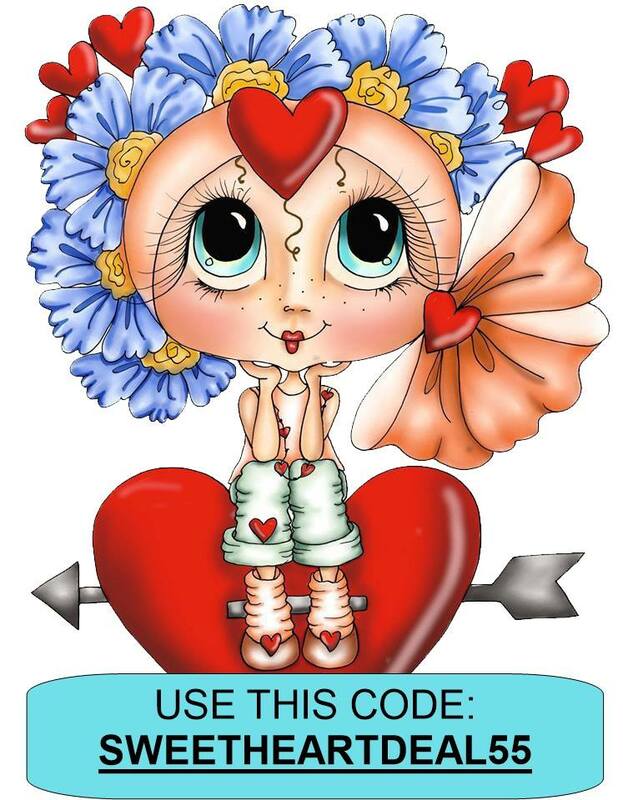 That's why I seem drawn to Sherri's images even MORE than usual when they have flowers on them! This one is called Fancy Pants Img 74 and can be found in the store here. 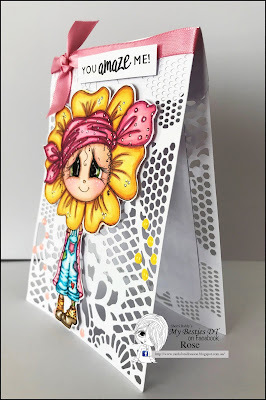 A detailed write up will be posted on my blog at www.luvmycards.blogspot.com . Please enjoy wandering through all the different categories in Sherri's store! 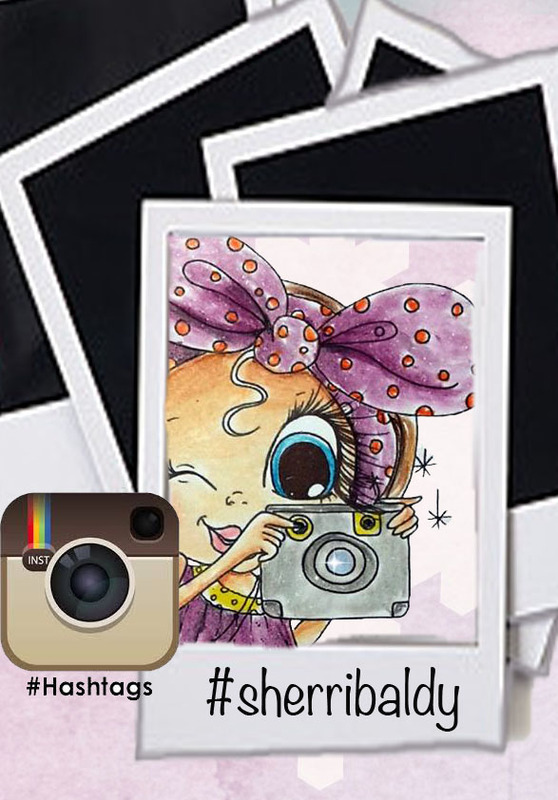 Not only images but papers, flowers, embellishments, fabric, oh the list goes on! Hi Everyone, Cindy here I have this sweet card to share with you today, She is from the Heart Besties collection img869 and I thought what a nice image to use for anytime of the year. I have colored her with Copics. 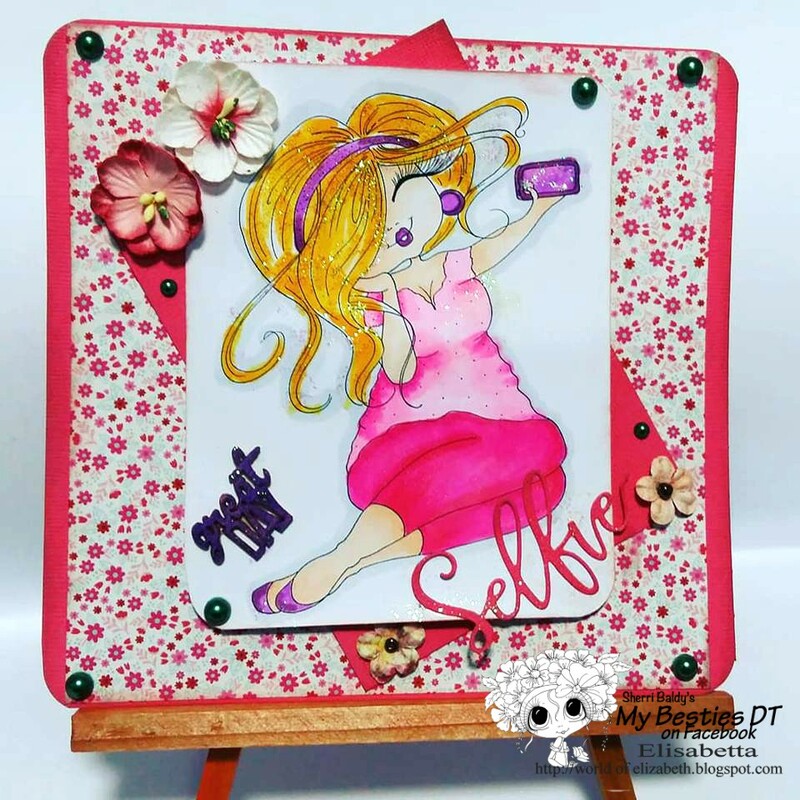 I've cut her out and mounted her then added her to the background which I have made with color blocking and and embossing folder. thought it was sweet idea, and then added some satin ribbon, some color dots and the sentiment. 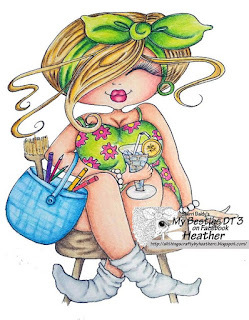 Hi everyone, It's my turn on Sherri's Art Blog and I'm thrilled to be here! 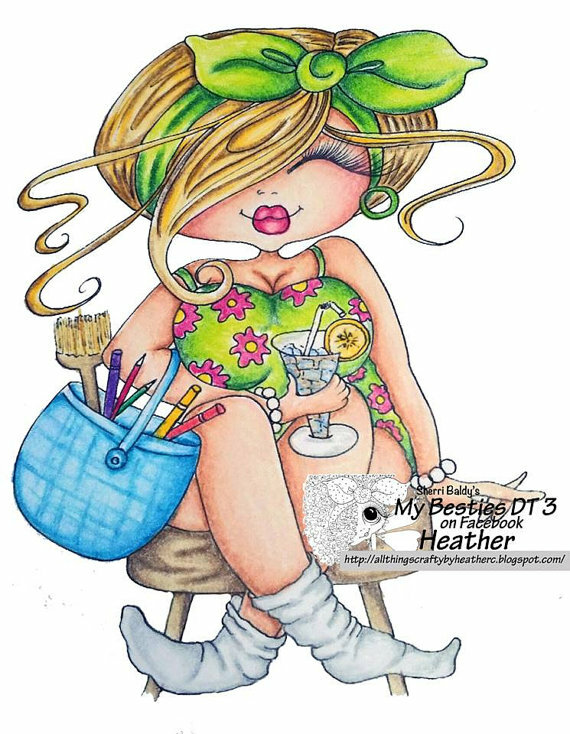 Today I'm using her Img 955 and I decided to color her in some Spring colors instead of pinks or purples. I'm SO tired of all the cold winter weather chills and with Spring officially here, I was feeling yellows and oranges! I used copics on all her coloring. 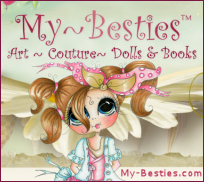 Hope you enjoy her-she can be found in the Besties shop here Have fun! 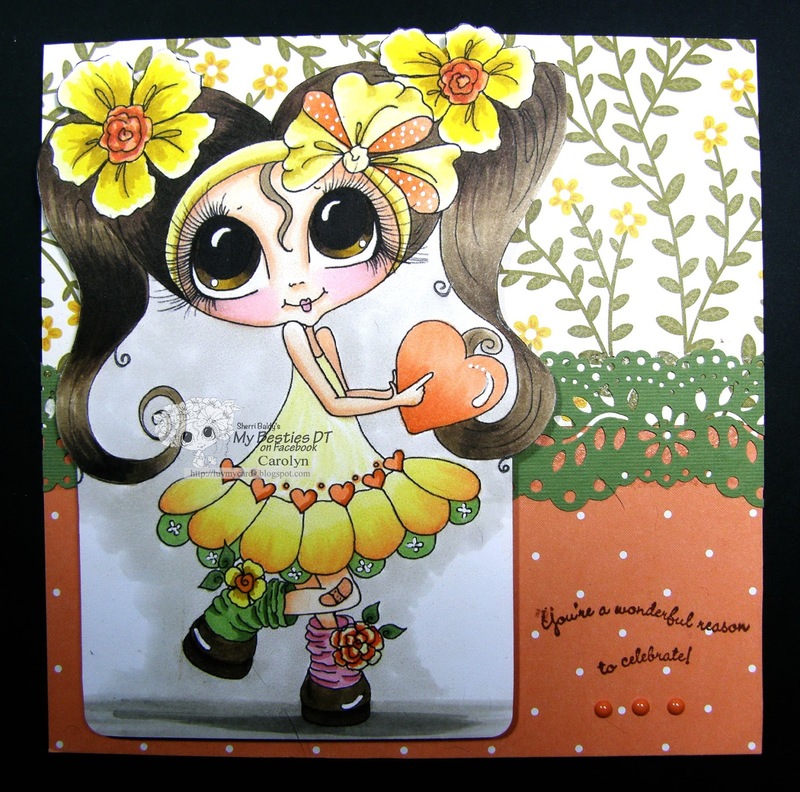 Today I am sharing an image I colored with my Spectrum Noir Pens Scan0142 and she is such a sweet little fairy!!! I added the perfect sentiment and some pretty sparkly gems and ribbon. Hi Everyone, Cindy here to share my project with you using this adorable Enchanted Unicorn Bestie IMG 384. 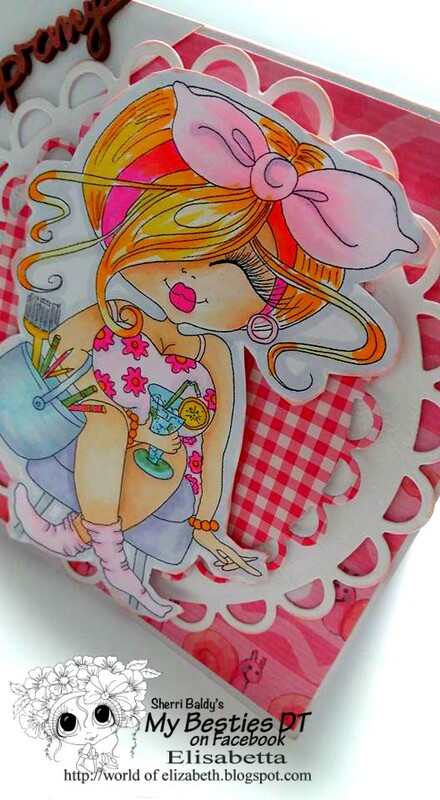 I have colored her with Copics and cut her out with a stitched die. 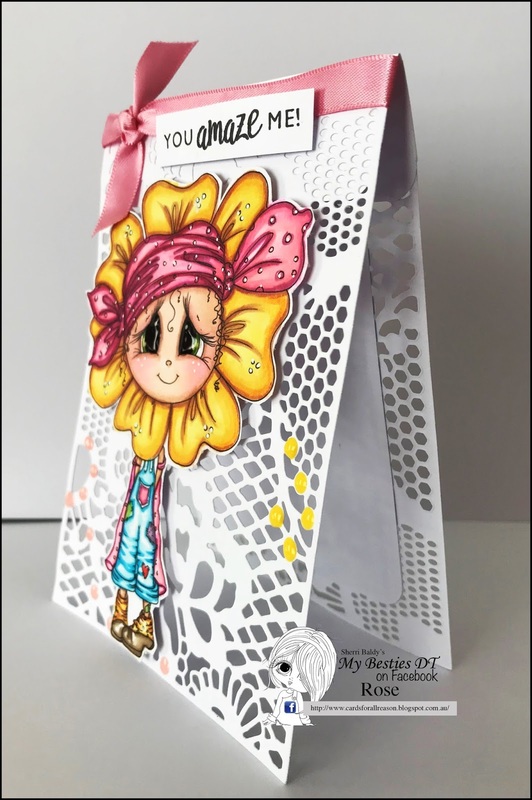 I've used a couple of different designer papers some ribbon and a border punch on the botttom paper. 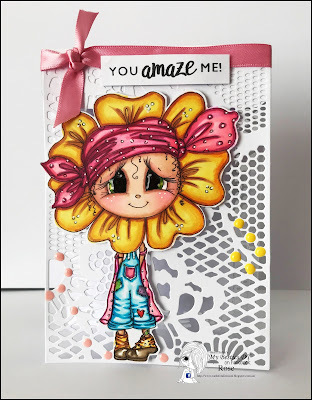 Added some beaded blooms and other flowers and finished the card. I haven't added a sentiment as I am not sure what I will use it for so may add it later at the bottom. Hi all! Here I am with the new March project that tastes like spring! 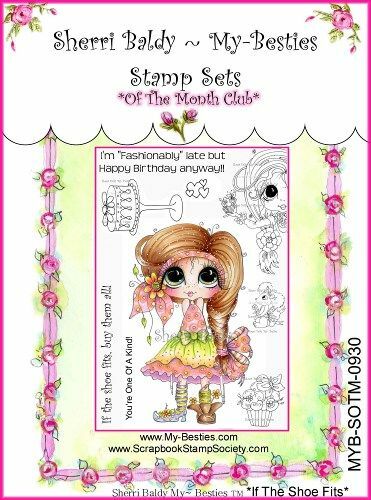 For me it was so, use the bright colors of this wonderful season with a lovely stamp! For this card I used the wonderful Sherri stamp colored with the Copic. I used bazzil for the base and bright pink paper as a background. I added a white die cut and a smaller fuchsia check. To complete a "Spring" writing in colored wood. 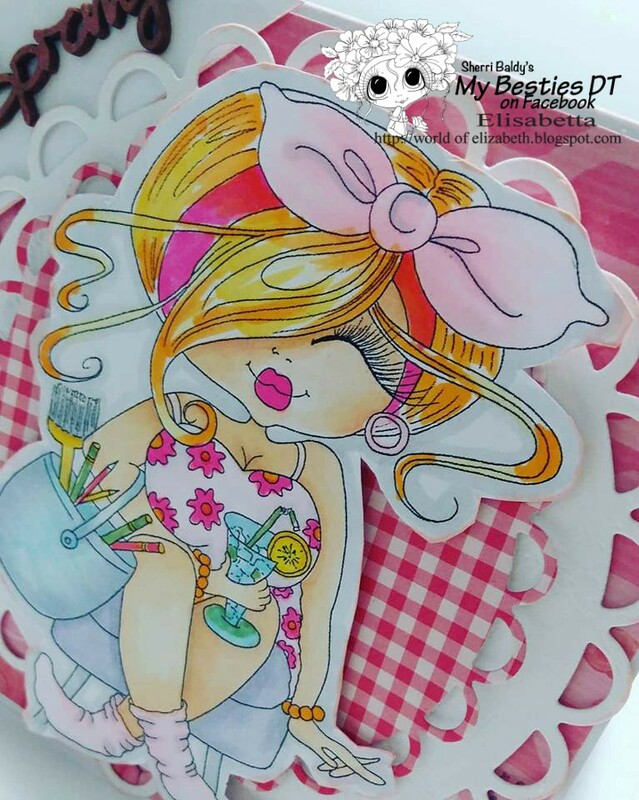 Dana here and today I am sharing an Card/image I colored with my Prismacolored pencils Img384. 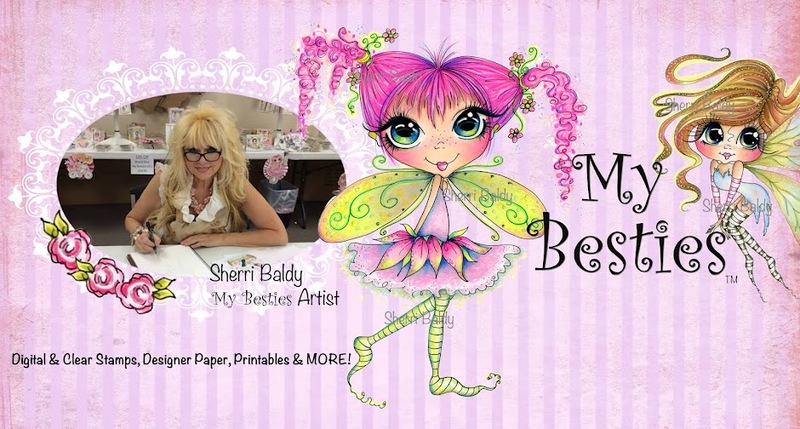 \She is such a sweet fairy image and you can find her at the My Besties shop. I added the perfect sentiment a ribbon and a pretty flower. It's Rose, here today to inspired with my new creation for the day . which have been released this month .. i just love them . I used bright pink bazzil and some small flower paper. 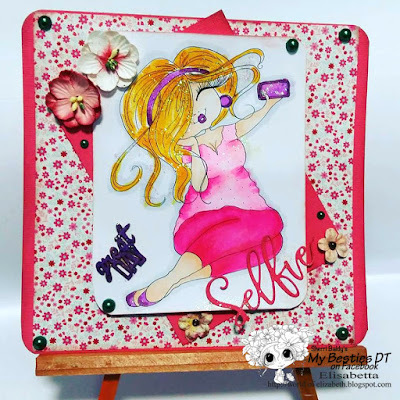 I decorated with fabric flowers, small pearls, a colored wooden sentiment and a selfie punched piece. To color I used the Copic. Hi Everyone, have you seen the new images in the shop this month, This is one of the Adorable Blooms just released Img923. I have colored it with copics, and made a simple card with it as I think it is just so sweet. I have used some designer paper a scalloped border punch some ribbon and made the banner for the sentiment. Bows, Y19,15,11 B14,12 for the stripes. Hope you like what I have created and shared ..